Focus on Nia and everything will be okay. Surfing the internet this weekend, I stumbled across some… umm… interesting news about a couple of upcoming black comedies. 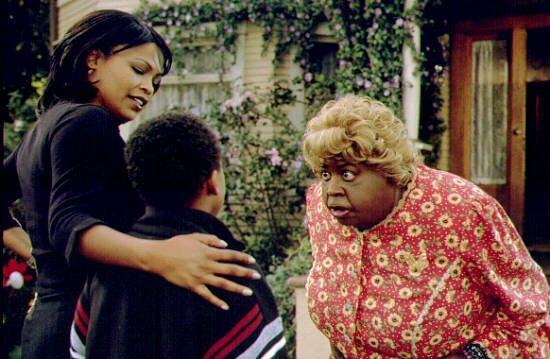 If last week’s Bad Boys 3 news wasn’t enough for you, it appears Mike Lowry’s partner is throwing the fat-suit and wig back on to reprise his role of Big Momma in a third installment of the series. I’ve really got nothing else to add. In slightly more promising news, Ice Cube, Brandon T. Jackson and Bow Wow are set to star in Lottery Ticket. The movie apparently revolves around Bow Wow’s character, who is in possession of a winning lottery ticket and needs to cash it in before his “opportunistic” neighbors get a hold of him. Or something like that. Personally, I don’t want to see Ice Cube in a movie revolving around the lottery unless it’s All About the Benjamins 2. With that said… check out a clip from the LMBAO-classic-rated movie after the jump.